Appalachian Voices is devoted to protecting the Appalachian heritage. They also have a Front Porch Blog with news. Related: I Love Mountains, campaigning to end mountaintop removal. They also have a National Memorial to the Mountains, showing each destroyed mountain on Google Earth. Need high speed access to use this. There's a nice interview with Appalachian Voices director Mary Ann Hitt , a Gatlinburg native, on the environmental magazine, Grist. Friends of the Blue Ridge Parkway. Sustainable WNC is a collection of resources, news, and blogs. It also includes a link to a Blue Ridge Web Market. This seems loaded with resources (stores, lodging, restaurants, crafts, etc.) with businesses in the Asheville area. Need to see more from the far western counties. Had almost forgotten what it looks like. On the left, down in the brush, dogwood blossoms just forming. No rain in well over a week, so at least we're spared some of the normal smoke from brush burnings this time of year. Not as bad as Chattanooga, which is 9 inches below normal rainfall and smoky from lots of wildfires. Despite the 80 degree weather the last few days, though, things seem to be blooming on a normal schedule, at least according to what I posted this time last year. Happy honeybee on peach blossoms. Ocoee River, McCaysville Ga/Copperhill TN. Dusk, Cherokee Hills golf course (Murphy). (Added later:) Not quite so hot in Boone area, check out the view from Marie's deck. Fred First posts a link to an image of a Salon list of the best Southern cities. Among them, Fred's home, Floyd, Va. The photo is by longtime blogger (Fragments from Floyd) First. Fred comments on what affect this attention might have on Floyd here and here. 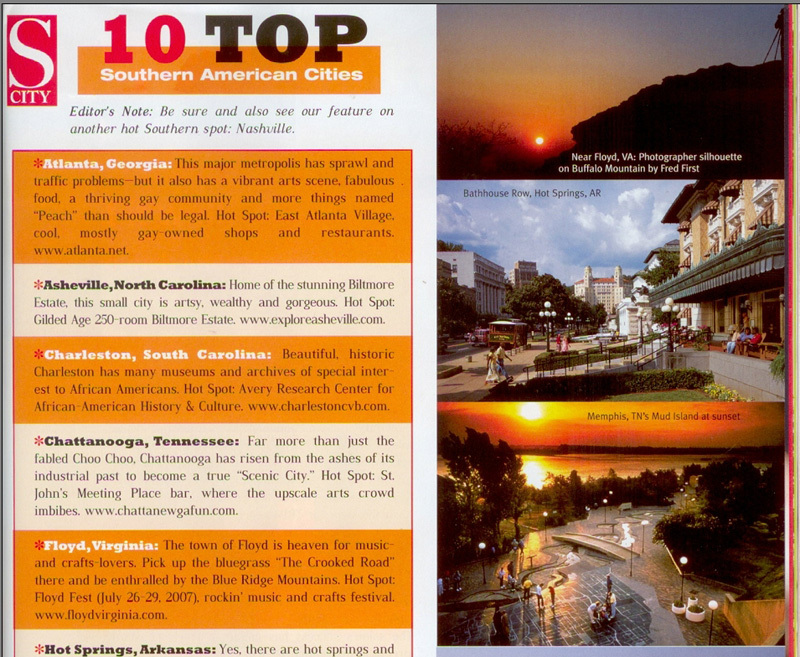 The list also includes our nearest cities, Asheville NC and Chattanooga, TN. Both well-deserving. Peach blossoms and smiling crescent moon. (Added later:) I didn't plant this Bradford pear, and wouldn't plant any others. What good is a pear tree with no pears? Check out this 'mountaintop' poem about the Bradford Pear, which calls it 'the Paris Hilton of trees'. In Buncombe County, they're getting serious about the problem of large developments on mountainsides and ridgetops. Seems the whole of Western NC could use this campaign: SaveOurSlopes.org. It will be cooler this weekend. But no sign of any more cold down the road yet. Not spring yet but a few days of warm weather have things popping out. Daffodils are everywhere but not up here yet. The dogs liked it too.